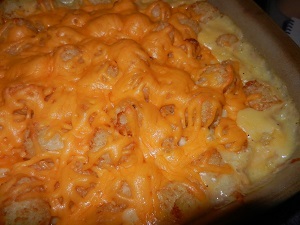 The Kerrie Show: The Tater Tot Casserole Cookbook is the Perfect Christmas Gift!!! The Tater Tot Casserole Cookbook is the Perfect Christmas Gift!!! Ho ho ho! Need a last-minute fun and unique Christmas gift? Got Amazon Prime? 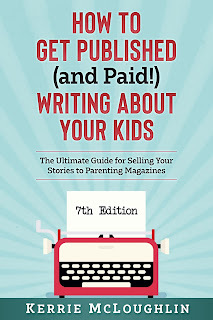 Get this book in 2 days for only $6.49! 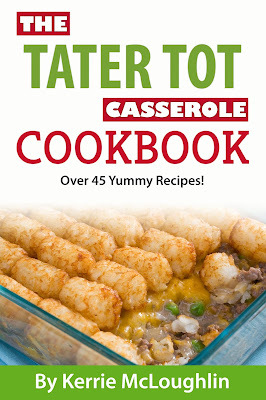 Did you know The Tater Tot Casserole Cookbook is a great Christmas gift when you don't know what to buy for someone? Sure, candles are universal gifts, and maybe even a box of chocolates (unless there are food allergies), but YOU CAN'T BE ALLERGIC TO A COOKBOOK and it doesn't smell like anything that might offend your sensitive nose! 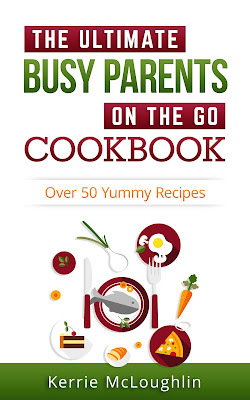 Did I mention the cookbook has a gluten-free recipe and a dairy-free recipe and even a vegetarian recipe? Did I mention it's cheap (under $10 shipped ... and only $6.49 with 2-day shipping if you have Prime! ), FAST and you also get a free Kindle edition of it? Win-win-win-win! Wait, did you hear that part? You buy the print book for SOMEONE SPECIAL and you get the ebook version for yourself! Yum. Dairy-free peeps, back off this version. I am a people pleaser, friends, and I tried to include everyone I could. I do NOT, however, have a peanut-free version but there were no nut products in there in the first place! I am an include-everyone kind of gal. In the interest of pleasing everyone, I put 13 dessert recipes in there so the sugar-lovers like myself are happy. I think there's a recipe or two with some fruit, so that's healthy, right? Oh, and I put in a meal planning chapter. Wa-hoo! These are the Heavenly Sinful Bars and I guarantee there is zero fruit in them. Prepare for your Sugar Coma. Check out the reviews when you go see the book page! The only downside is that I could not include color photos of recipes because of the cost it would pass on to you. So make your meals, take your pictures and share them with me here on my Facebook page! Here's the PRINT LINK! Only $6.49 and shipping is free if you have Prime! My sales page is all done. Now you can get back to your life. AFTER you order a copy of the book. And yes, I am still working on this one ... got a new cover made and everything! Stay tuned! Follow me on my Amazon author page so you get the update when it comes out!